Size: Adult - 1/8" to 1/2"
Identification: You know what a house fly looks like. Round, lots of bristles, long legs - lovely! Mouthparts are spongelike. Biology and life cycle: Eggs to larvae to pupae to adults in just eight days. House fly eggs are laid in masses in dung or rotting organic matter. Maggot-like larvae develop fast and pupate in about a week. Complete metamorphosis. Habitat: Flowers, excrement, and decaying organic matter. Feeding Habits: House flies feed by lapping up liquids with their sponge-like mouth parts. Economic Importance: Vectors of several diseases and can be troublesome to livestock and humans. Natural Control: Fly parasites, flycatchers and other birds, dragonflies, and beneficial microorganisms. Organic Control: Fly swatters and natural diatomaceous earth fed to animals. Releasing the beneficial insect known as the fly parasite will eliminate almost any fly problem. Spray with citrus oil and plant oil products. 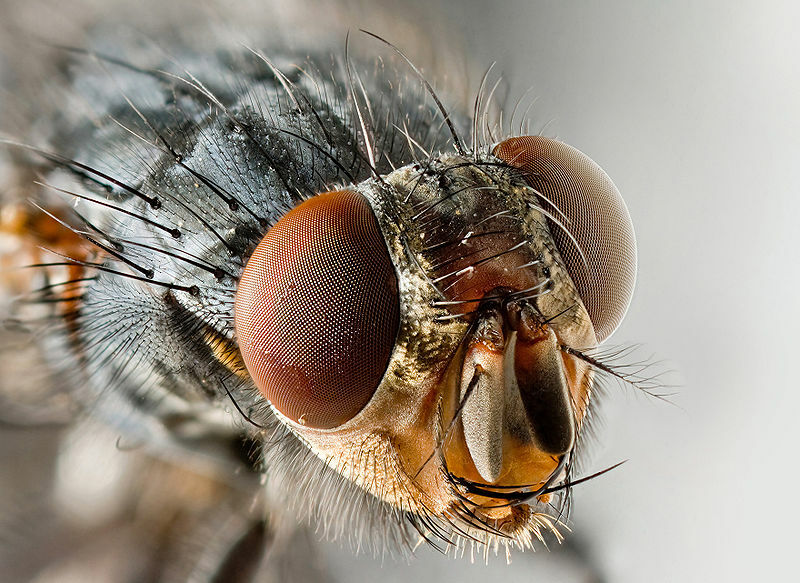 Insight: House flies don't bite as horse flies do. Fly larva maggots are important in helping to dispose of organic waste. During the seventeenth century, the belief prevailed that every living thing possessed some special usefulness to humans. If we took this approach today, there is no telling what we would discover. Instead we spend most of our resources making toxins designed to destroy many of the little creatures that share the planet with us. The lowly house fly has virtues that have been recognized but not given due credit. The people making compost understand how the housefly is constantly moving the decomposing microbes around, which keeps the materials being composted well inoculated. Probably the fly's greatest benefit to man was discovered during World War I, when the medics noticed that wounds of soldiers lying on the battlefield for hours did not develop infection, as did those that had been treated and dressed promptly. The difference was due to the fact that the older wounds were always infested with maggots, which were larvae of the house flies. The remarkable discovery that these maggots were much better than any known surgical or medicinal treatment for cleaning up the infection in deep-seated wounds has lead to the practice of rearing maggots of the housefly and introducing them into wounds to eat out every microscopic particle of putrid flesh and bone. A secretion of the maggots has also been found to even help to heal wounds. As the maggots eat the infected, rotting tissue, they also kill the pus-forming bacteria by digesting them, and they continually apply minute quantities of the healing secretion to the depths of the wound more effectively than instruments can. House flies don't bite as horse flies do. Fly larva maggots are important in helping to dispose of organic waste. 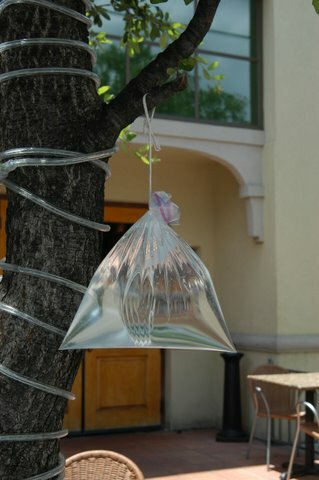 Hanging clear plastic bags filled with water help keep the flies away.